The Travelon Anti-Theft Concealed Carry Hobo Bag is a bag made from 1260 D Nylon material, which is safer to carry. The main compartment has RFID protected card and passport slots, a padded, fleece lined pocket for iPad or tablet, and tethered key clip with LED light. It includes a rigid back wall that is lined with hook and loop and a reversible holster. The holster secures to the board and can be positioned to accomodate the size of the firearm and the personal draw preference of the user, ensuring a more secure draw. For extra protection, this bag includes designated pockets for pepper spray and a knife. 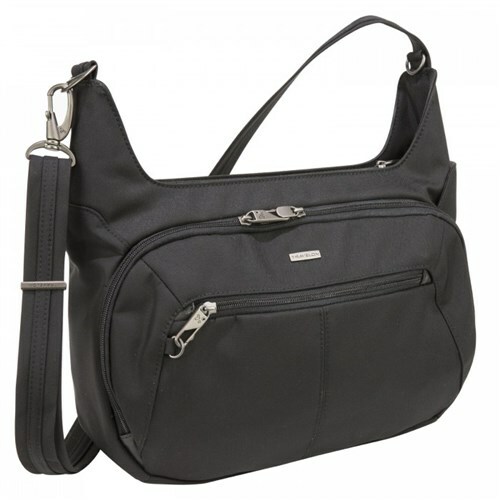 The Travelon Anti-Theft Concealed Carry Hobo Bag - Black has many exciting features for users of all types. You can extend the lifetime of your Travelon Anti-Theft Concealed Carry Hobo Bag - Black with the purchase of a FactoryOutletStore Factory Protection Plan. See the Travelon Anti-Theft Concealed Carry Hobo Bag - Black product video and gallery images above for more details. 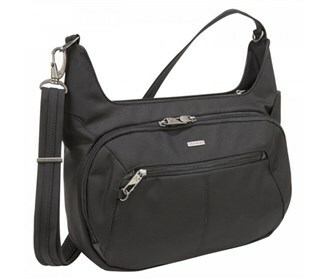 The Travelon Anti-Theft Concealed Carry Hobo Bag - Black is sold as a Brand New Unopened Item.